Thread: Hello from northern Sweden! Everything about kilts are new to me and I have a lot of questions so here goes. As far as I have been able to understand from reading forum posts I can still wear and enjoy a kilt even if there is not a drop of Scotish blood in me. That is wonderful. This past summer i created something that I will describe as kilt-esque on a whim and found it very comfortable and I liked wearing it. From there i have been thinking that I should get a real kilt. Spontaneously I feel that a utility-type kilt would be ideal for me. Both for practical purposes and also as I know there is a lot of significance woven into the tartan patterns and it would not really feel right to wear one when I have no Scotish heritage. Now for my question. At some point in the future I might also try my hand at sewing a proper kilt. And I saw somewhere that there are official tartans for different countries. 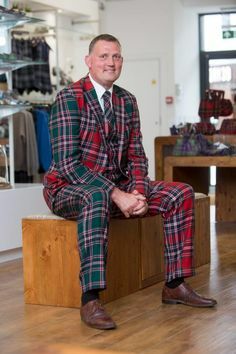 Although I have no connection to Scotland I am of dual Swedish/Finnish heritage and for that reason I am wondering wether it would be acceptable to make a kilt containing two different tartan patterns or if that is something that is not ok.
Two tartans, eh? Well yes, you could do that, I just can't imagine why anyone would but them, I'm a traditionalist, plus it would be an awful lot of work and the lines wouldn't line up. Of course, two tartans that connect with you might be a really REALLY good reason for two kilts . . . . Hang around here for a while and get some ideas before you invest your hard, cold cash in an unusual idea. Thank you for the advice. I will definitely not start making anything for a while. The image that popped into my head was to make only the insides of the pleats in tartan and either alternating every other pleat or having one pattern on each side. This could help with the lines not adding up I think but it would still be a lot of work and money. I will definitely keep reading the forum. Aye indeed laddie! If you are looking at building your own kilt, an X-kilt is often thought of as the best starting place in the utility range. For something traditional, get a copy of The Art of Kiltmaking (known here often as "TAoK") from Barbara Tewkesbury - an advertiser found at the right. Don't buy it from book-sellers - get it cheaper than many from Barbara. Well met and welcome new friend. I recommend following the advice of Father Bill. I agree to take your time and find the fix that fits all you are looking for in the future. Many tartans don't have the family or clan connection which relieves the tension about overstepping boundaries (real and fictional). Search among the many options and I'm sure you will find something that works for you. Glad to have you join us and hope you will keep us updated on your progress. Welcome from a cool and grey North Texas. I was recently looking at "Nordic" tartans for a quiz to celebrate Burns' Night at work - our head office is in Sweden and we have other offices through out Scandinavia and the Baltics). There are a couple of Swedish and Finish tartans out there. David McGill of internationaltartans.co.uk has designed and registered both. There are also 3 variants of a Swedish Tartan (modern, ancient and reproduction) made by D C Dalgliesh which you can find on ScotWeb and I also found an image for a Dark Swedish tartan as well - but no idea who makes it. 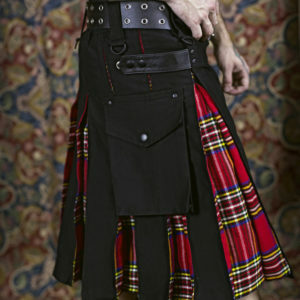 Mixing 2 tartans (at least in one kilt) is anything but traditional and I have seen a both utility kilts and more traditional styled plain black wool kilts (take a look on scotlandshop.com) offered with tartan inserts in the pleats. I also recently saw a 2 tartan kilt by Clan Kilts (Black Isle and Grey Douglas) and think they made a good job of doing something more contemporary without being too outlandish and reflecting some of the more traditional aspects. Welcome to the forum from Western Canada !